Once a year SF Sketchfest rolls around and blesses the City by the Bay with all kinds of clever geek humor. Two weeks of sketches, stand up, podcast recordings, improv, reunions, and various other celebrations of comedy. If you’re into it, the festival probably has it. Did you know Maya Rudolph has a Prince cover band named Princess? Because she does, and they were at SF Sketchfest. Do you want to watch a live reading of a Futurama episode? That’s there too. Kristen Schaal worshiper? Check the schedule because she’s in a few things. With so many events and performances, big and small, it could in all likely hood be impossible to got to everything you to want at the festival. It’s the Bay Area’s comic con of comedy; you must choose what you attend wisely. I attended for the first time last year with mixed results at a Garfunkel & Oates/ Reggie Watts concert (in my opinion it needed more of the adorably profane G & O). It was a good introduction to the festival, and left enough of an impression that when this year rolled around I jumped on the website and scoured the list of shows. I could afford one, and I knew exactly which one it was going to be. 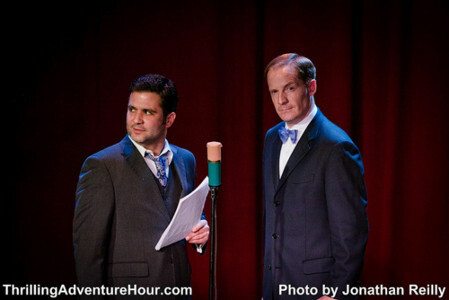 With The Thrilling Adventure Hour creators Ben Acker and Ben Blacker have crafted an entertaining love child that pays homage to the old radio shows of yesteryear. Actors take the stage in their suits and gowns and preform in a variety of features in front of a live audience. Accompanied by the Andy Paley Orchestra that only adds to the glee and energy of the stage performances they record at their home base the Largo in LA with episodes then released free in podcast form to the masses. The genres of the features that make up Thrilling Adventure vary greatly. Sparks Nevada, Marshall On Mars takes cues from the old Lone Ranger serials complete with a Tonto-esque blue skinned Martian sidekick named Croach the Tracker. 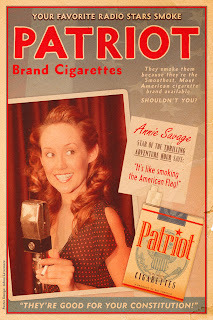 Amelia Earhart, Fearless Flyer’s flare is towards the WW II pulp propaganda radio shows where you punched those darn dirty Krouts. 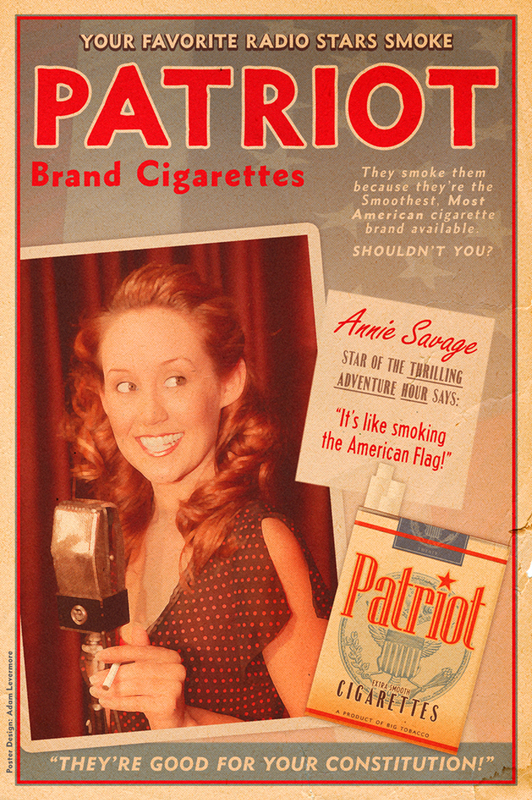 The wholesome super hero stylings of Captain Lazerbeam make it the swell kids show that is brought to you by Patriot Brand Cigarettes (one of the production's two outrageous fictitious advertisers). The playfully spooky and boozy Beyond Belief that often caps the night has its main characters rooted the quirky, loving nature of Hammet’s Nick and Nora Charles (as a huge fan of the Thin Man series that makes me one happy geek). And that’s just the ones I listed. Twice a month at the Largo episodes from a selection of those titles listed above are brought to life by Thrilling Adventure's stable of regular actors (called Work Juice Players) such as Mark Evan Jackson, Autumn Reeser, John DiMaggio, Paul F. Tompkins and Pageant Brewster. They also have an impressive revolving door of guests. Much of the cast of Community has taken the stage, Nathan Fillion pops up from time to time, J.K. Simmons has sung a few times. Just recently an episode was taped with Joseph Gorden Levitt on the show. Half the fun of listening is finding out who’s appearing next on stage and as what. A robot? A genie? A giant hypercow? Anything is possible. the show includes fake commericals. 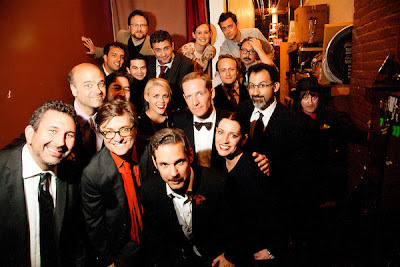 Despite preforming to regularly sold out audiences in LA, recently running a successful Kickstarter campaign where they raised money not only for a graphic novel being published by Archea, but also enough to fund the production of a concert film, Thrilling Adventure Hour does travel on occasion. Preforming a mashup of various released episodes with their actors and orchestra in tow, they were listed for SF Sketchfest. It was an opportunity I couldn’t pass up. With my ability to travel and find a decent couch to crash on in SF far easier than attempting something similarly in LA, with also LA requiring a bit more extensive planning as the show sells quickly (quickly isn't even the most appropriate word as it's LA fans are exceptionally devout- like Trekkie devout, and I mean that in the best way), I jumped on it. And it paid off. Watching theater performances has always been something I’ve enjoyed since I was knee high to the Von Trap kids when I was taken to the Sound of Music. There’s something about dressing up and being apart of the audience, apart of that performance and moment. It was fantastic, Hal Lubin’s introduction of Sparks Nevada that kicked off the show led us into an exciting tale involving a giant spider and a talking horse that had pistons. Amelia Earhart traveled through time to fight the Nazis. Captain Lazerbeam teamed up with his fellow hero, the underwater detective with a Batman growl, Phillip Fathom to fight crime with the help of the Adventurkateers. Frank and Sadie Doyle of Beyond Belief drank their way through another mystery. Work Juice Coffee commercials filled the breaks between the episodes and the final bow had some forty odd actors on stage, revealing part of the army it takes to put the show. Afterwards I couldn't help but notice the audience. The crowd was diverse, all ages (it is a fairly PG show, save for some alien killing and the Doyles joyful alcoholism), all genders, and many different walks of life. While the truly excellent team that puts the show on on is definitely a major reason we were all so drawn to attending, I couldn't but feel that Thrilling Adventure offers something other productions don't. Because of the radio format, the show makes you work your imagination. From the character voices to the sound effects to the orchestra's music, you're not taking visual cues. You have to listen, you have to think and come up with your own idea of how things look as they take place. Acker and Blacker utilize it so well in their scripts. And perhaps in a culture that's so over saturated with visual stimuli, where everything is in 1080p, part of what makes Thrilling Adventure so immersing is that you have to lend a part of yourself to the story in order for it to all come together. It's the magic of the imagination being harnessed.